Average Weight	: 100+ lbs. Dedicated to the rescue, rehabiliation and rehoming of dogues de bordeaux nation wide. Dogue de Bordeaux Rescue, Inc. Rescue, Rehabilitate and Rehoming Dogues de Bordeaux in need nationwide. Despite the Dogue de Bordeaux's typically French name and character, its origins are most likely the result of England's comparatively brief occupation of the Northwestern French province of Aquitane. Although sporadic reports of the Dogue de Bordeaux have been around since the 1200s, the breed wasn't specifically recognized by name until an early dog show in 1863. The generic term "dogue" had been in use to describe larger hunting and working dogs in the French countryside, and in the absence of official breed standards, the winning dog (from the Bordeaux region) was referred to simply as the "working dog from Bordeaux"--or "Dogue de Bordeaux". This Breed is believed to be descended from the Bulldog, Tibetan Mastiff and from the Greek and Roman Molossus, from mastiffs brought to Europe by the Alans, from the dogs of Aquitaine or from Spanish dogs from Burgos. At the end of the Middle Ages, the Dogue was used as a cattle driver and personal bodyguard. Lots of Dogues died during the French Revolution. After the war number rose again. Raymond Triquet and his French Dogue de Bordeaux Club saved the breed. The Dogue de Bordeaux is now thoroughly established in France and gaining popularity in other countries. The breed has served as a war dog, flock guardian, cattle herder, guard dog, trained to bait bulls, bears, and jaguars, and as a hunter of boars. Despite this breed's name, which is somewhat difficult to pronounce, the Dogue de Bordeaux is surprisingly famous as a breed. 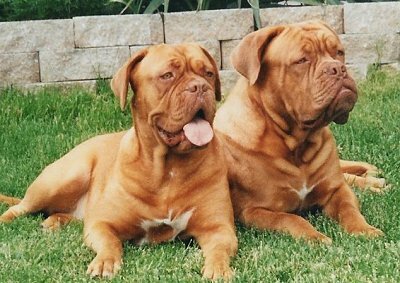 The dog accompanying Tom Hanks in "Turner and Hooch" was a Dogue de Bordeaux, and the distinctive wrinkled, masked faces of the Dogues are often used as a shorthand for powerful, menacing mastiffs and bulldogs in cartoons and popular imagery. In contrast to their menacing image ~ Dogues de Bordeaux are loyal protectors and companions to both adults and children. The dogs have extremely large and wrinkly heads in proportion to their bodies, which is impressive considering how large and powerful the dogs' bodies are. The Dogue's feet and tail are both large as well, and their necks have a distinctive "wattle" that in conjunction with their droopy ears gives the Dogue a slight appearance of laziness--an appearance that's revealed to be illusory when the Dogue is called on to protect his or her owner[s]. The Dogue de Bordeaux goes a long way on the strength of its frightening features and its frightening size, which would make the Dogue a valuable guard dog and protector even if he or she never made a sound. It's this frightening size and ferocious appearance that has made the Dogue ideal for purposes of war, purposes of fighting, and purposes of hunting and guarding throughout the breed's nearly thousand-year history. But the secret of the Dogue de Bordeaux is this: its appearance belies its actual temperament. The Dogue de Bordeaux is, in fact, one of the most affectionate, calm, and companionable breeds in existence. The Dogue de Bordeaux, like some other large mastiff breeds, has very little feeling of pack organization--and thus is more drawn to form bonds of companionship with human beings. The Dogue is extremely loyal to his or her chosen masters, and often feels abandoned when these masters leave for long periods of time. This quality of companionableness with humans also makes the dog a much more useful watchdog then some of the excitable terrier breeds--whereas the latter dogs will yap and bark in order to frighten away virtually anyone who approaches them, the Dogue de Bordeaux relies on its terrifying size to frighten away criminals, and instinctively trusts and respects anyone else--until they prove their bad intentions toward the Dogue's masters, at which point the breed's ferocity takes over with grim results. This general companionableness, coupled with the Dogue's origins as a herder, makes the Dogue good with children or smaller animals. The Dogue, aware of his or her own strength, will tend to protect and shepherd weaker animals from harm. Larger or equally-sized animals, however, should not be kept with the Dogue de Bordeaux as a rule--the Dogue has a history of hunting and fighting larger animals, and your dog may respond aggressively to these perceived "targets". The Dogue de Bordeaux has a low energy level, considering its size, which can make it a moderately frustrating breed when it comes to training--although the Dogue is extremely intelligent, it can often become simply too fatigued to work with a trainer for more than an hour or two at a time. Anyone who's interested in the Dogue de Bordeaux because they assume that its large size must equate to a high level of energy and playfulness would be well-advised to look elsewhere--although anyone who's interested in large dogs, but who dislikes their sometimes obnoxious and aggressive activity and playfulness, might find the Dogue de Bordeaux an ideal friend. As with many heavy dogs, hip dysplasia is a significant problem. Dogues de Bordeaux are also susceptible to some forms of cancer. One breed-specific ailment has to do with the Dogue's larger-than-average head, which can cause trouble for female Dogues during the birthing process. Veterinary assistance should usually be secured if you plan to breed your Dogues de Bordeaux--the breed has a fairly high litter size, but problems with birthing (and with the extremely large dogs accidentally crushing or smothering their litters) can reduce this very quickly. One specific challenge when grooming the Dogue de Bordeaux is the problem of its wrinkled face. It's important to bathe the Dogue on a regular basis--or simply to wash its face--in order to clear out any dirt that may be trapped in the folds. This will help to prevent any skin infections or irritations and keep the Dogue healthy. Although one wouldn't necessarily think it (given the Dogue's massive size), the Dogue de Bordeaux doesn't require a great deal of exercise in order to stay healthy. Quite the reverse is true, in fact--too much exercise during the dog's first year of life can result in underdeveloped or overstressed bones and muscles, which can result in severe health problems (or even in early mortality.) So it's wise to restrict the Dogue de Bordeaux's exercise during its early years, only playing with the dog for perhaps an hour a day. The energy level of the Dogue de Bordeaux is low when compared with its potential power and strength, and this should be respected when exercising even adult Dogues. One or two walks (or more) per day should be considered a given, but can for older dogs also often be considered sufficient. Giving the Dogue free reign to run and play is also a good idea if you have the space for it. You'll need to train your Dogue de Bordeaux extremely well for one simple reason: a male adult Dogue de Bordeaux can easily weigh upwards of one hundred and fifty pounds. This limits the amount of control anyone can have over a dog! Surprisingly (given the Dogue's size and strength), active physical training should be kept to a minimum until the Dogue reaches adulthood at about one year. This is for a practical reason: all large dogs are especially susceptible to joint problems (hip dysplasia in particular), and the more active a large dog is in its youth, the more likely its skeleton is to develop problems in its adulthood. So it's wise to focus the young Dogue de Bordeaux's training on more basic commands (heel, sit, and the like), and only later to introduce more complex tricks or other athletic training. Positive methods should generally be relied on when training the Dogue de Bordeaux (or any breed of dog), but a few negative methods can be effective for curbing the Dogue's natural enthusiasm. The Dogue thrives on human companionship and tends to view being left alone as a punishment for bad behavior. If you feel that your Dogue is not responding well to training and continuing in extremely undesirable patterns of behavior, you can simply leave the Dogue on its own for some space of time. Ideally you should do this in a place without many breakable objects or targets for vengeful destruction, but the Dogue de Bordeaux's sense of honor and shame will most likely prevent it from causing any havoc in your absence, and with any luck the old negative behavior pattern will be significantly less strong as a result. More excitable negative methods, however--in particular shouting or striking the dog--should definitely be kept out of your training repertoire. While the Dogue de Bordeaux is as a rule a fairly calm breed, its instinctual history of fighting and protection can come into play very quickly when the dog feels threatened--and with the dog weighing in at more than one hundred pounds, this can lead to serious problems for you. Loyalty will more than likely keep the dog from actually harming you, but negative methods will cause the dog to lose a great deal of its respect and sense of authority, two things which are vital to any successful training effort. Instead, remain calm and consistent in training, relying on positive methods far more often than negative, in order to see results. And remember to be patient--although the Dogue de Bordeaux is intelligent, its fairly low energy level may make it unwilling to devote long periods of time during a single training session to master a command or trick. So training sessions should be kept short--perhaps an hour at most--and should if at all possible dovetail into general play, exercise, and companionship in order to keep the dog's attention and to create bonds of respect and affection. Even with these shorter training sessions and this lower energy level, the Dogue de Bordeaux will eventually catch on and be willing to obey.